Gillikan Country's Galinda Upland: The Good Witch of the North . . . or South? Who can say they have been changed for the better? I have been changed for good! Glinda the Good Witch states to Dorothy Gale she is directly from the North. But, everyone who has watch the classic 1939 Oz film and others who have read Maguire's novelsand have watched the play Wicked know Galinda does live in the North. Baum's novels actually show her living down in the red outskirts of the Quadling Country in the South. If Galinda was from the North she would have been from the purple section of Oz called the Gillikans. Purely a different section of Oz altogether. Current Oz novels may still show Glinda living in Quadling Country. "You have no power here! Now begone, before somebody drops a house on you! " *Billie Burke's total screen time as Glinda, the Good Witch of the North, was only twelve minutes. Billie Burke's dressing room was just as every bit as enchanting as the role she played in the film in that it was decorated in pink and blue with pink satin walls and a pink chaise-lounge. Billie Burke's salary while filming The Wizard of Oz was $766.67 per week. 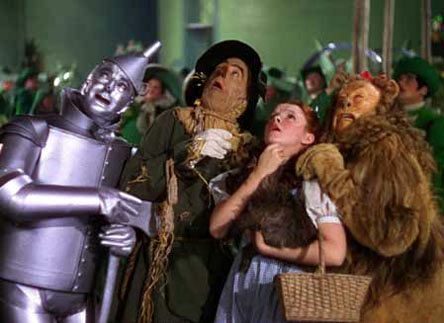 In the book, The Making of the Wizard of Oz, Aljean Harmetz points out that "From the moment Glinda asks the Munchkins to come out of hiding until the explosion that signifies the arrival of the Wicked Witch of the West, all the conversation is in rhyme and song." Arduenna = her last name in Maguire's book! "Are people born wicked? Or do they have wickedness thrust upon them?" Born on July 24, 1968, in Tulsa, OK.
Education: Oklahoma City University, bachelor of arts degree in musical theatre; master of arts degree in opera performance. Kristin Chenoweth was born on July 24, 1968, in Tulsa, Oklahoma, and raised in Broken Arrow, Oklahoma. Dancing and singing were a big part of her life. "I grew up singing gospel and country music, and it was one of the biggest influences for me musically. I loved singers like Amy Grant and Sandi Patty. ... and I was also listening to Barbra Streisand and Judy Garland, but these are the singers that really made an influence on my life," she said in an interview with Robert Diamond for the Broadway World website. When she was 12, she sang for the entire Southern Baptist Convention, performing "I'm Four Foot Eleven and I'm Going to Heaven." She wanted to head to Nashville right after graduating from high school, but her parents insisted that she go to college. She studied at Oklahoma City University, receiving a bachelor of arts degree in musical theatre and a master of arts degree in opera performance. While there, she won the Miss Oklahoma University title, and was runner-up in the 1991 Miss Oklahoma beauty pageant. She performed in a stage revue at Opryland and then won a Most Talented Up-and-Coming Singer Award in the Metropolitan Opera National Council auditions, which led to a full scholarship to Philadelphia's Academy of Vocal Arts. Before leaving for Philadelphia, she took time to help a friend move to New York City, and while there she auditioned for an Off-Broadway show, "Animal Crackers," and was offered a role. She turned down the scholarship and accepted the part. Chenoweth made her Broadway debut in a production of Moliere's Scapin, starring Bill Irwin. She followed that in the spring of 1997 with the Kander and Ebb musical Steel Pier, winning a Theatre World award. The following season she appeared in the City Center Encores! production of Strike Up the Band, and the Lincoln Center Theater production of A New Brain. She created the role of Sally in the first Broadway production of You're a Good Man, Charlie Brown for the 1998-99 season, winning a Tony Award, a Drama Desk Award, and an Outer Critics Circle Award for Best Featured Actress in a Musical. The year 1999 found her on television with a supporting role on the AMC comedy-drama Paramour. She was then cast in the ABC-TV remake of Annie. She had her first non-musical role on Broadway as the star of the comedy Epic Proportions. She then signed a deal with NBC for a 13-episode commitment for her own talk show, simply called Kristin, which premiered in the summer of 2001. The show did not do well in the ratings, but Chenoweth said she would try it again. The year 2001 was a busy one for Chenoweth, as she signed to play in the pilot Seven Roses on CBS, released her first CD, Let Yourself Go, and played Marian the Librarian in a TV production of The Music Man, opposite Matthew Broderick. 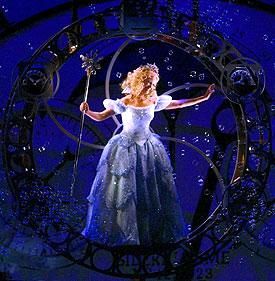 In October of 2003, she opened the Broadway production of Wicked as Glinda, the Good, where, as described by Entertainment Weekly, she hung "suspended in mid air in a mechanical bubble, armed with a magic wand, a sparkling smile, and a soprano that soars far beyond the land of Oz." 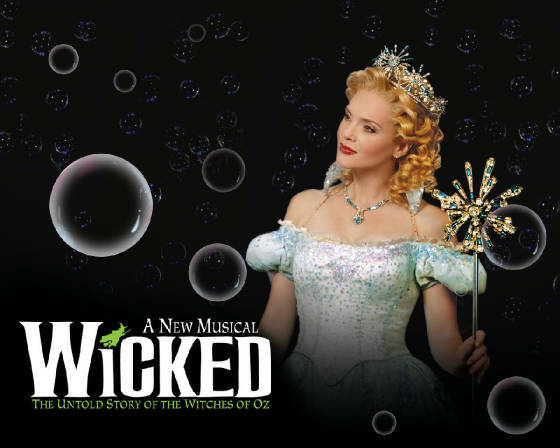 Wicked became a major Broadway hit, and Chenoweth was nominated for the 2004 Tony Award for Best Actress in a Musical. In Dance Spirit, Chenoweth admitted to the challenges of both singing and dancing in Wicked: "It's hard because, growing up as a dancer, you learn to engage the exact opposite muscles---as far as the diaphragm---as you do to sing. The trick is maintaining your technique---keeping the breath coming from down low and not totally letting your stomach hang out when you're dancing." Chenoweth has worked hard to stay in shape in order to keep up with the cardiovascular demands of her Broadway performances. She told Dance Spirit, "You've got to find ways to breathe while you're dancing so that when it comes time for you to stop and sing again, you have it. To prepare, I do a lot of aerobic activity. Many times at the gym, people will look at me because I'll be on the treadmill humming." Also in 2003, she began an ongoing role on Sesame Street as Ms. Noodle. She also starred in a video/DVD with Sesame Street star Elmo, in Elmo's World: Happy Holidays!. 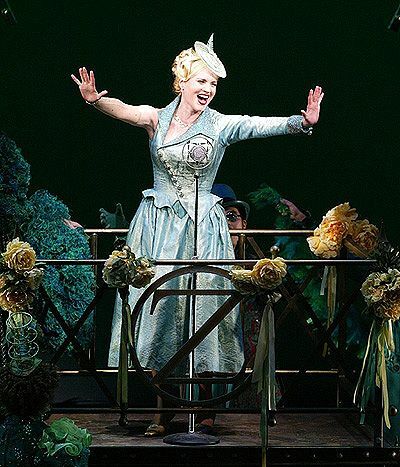 In the spring of 2004, as she was finishing up her run in Wicked and rehearsing for a role in Pink Panther, she fulfilled her dream of singing the role of Cunegonde in Candide. The song "Glitter and Be Gay" from that show has become a staple in her concert performances. In the fall of 2004 Chenoweth joined the television cast of NBC's Emmy-winning series The West Wing, as Annabeth Schott, the spitfire whiz at public relations. Of her busy career, she told the Broadway World website, "I don't vacation or have any sort of life. ... but there are bigger problems to have. I love my work so much, that I just want to do it all." In the spring of 2005 she released a new CD, titled As I Am, a collection of familiar Christian hits. "I've really wanted to make this spiritual, inspirational record since the events of 9/11, and I'm glad that I can finally put it out there," she stated on the Broadway World website. The album does include one non-spiritual song that has become a signature piece for Chenoweth, called "Taylor, the Latte Boy," a fun, lighthearted romp about a barista at Starbucks. In the summer of 2005 she played Marie, the nosy neighbor in Bewitched, a film starring Nicole Kidman. Next came Pink Panther, with Chenoweth playing alongside Steve Martin and Kevin Kline. She then went on to work on the film Running with Scissors, starring Annette Bening and Gwyneth Paltrow. Further roles are planned, with Emma Thompson in Fiction and with Robin Williams in RV, both scheduled for release in 2006. Chenoweth has performed with numerous symphonies, and held roles on and off Broadway, on television, and in film. It doesn't look as if her career will be ending anytime soon. But if it does, "I'm really interested in forensic science," she told Entertainment Weekly. "I'd love to learn about DNA and fighting crime." Galinda (or Glinda the Good Witch) is a fictional character in the Land of Oz created by American author L. Frank Baum. She is the most powerful sorceress of Oz, ruler of the Quadling Country south of the Emerald City, and protector of Princess Ozma. In Wicked, a novel by Gregory Maguire which reimagines Baum's Oz, the witch is initially known as Galinda is from northern purple descent and hails from the Gillikan Country in Oz. In Maguire's adaptation of Oz in Wicked the musical Galinda is known to not possess any powers at all. She is young, peachy, naive and blonde. It is known that Elphaba gives Galinda her first starter wand. In fact her rise to power was merely incidental and accidental. It is seen that Elphaba possesses most power in Oz except for the humbug attempts by the Wizard and weather "maneuvers" by Madame Morrible Head Mistress of Shiz University, Morrible later reigns as The Wizard's Press Secretary. 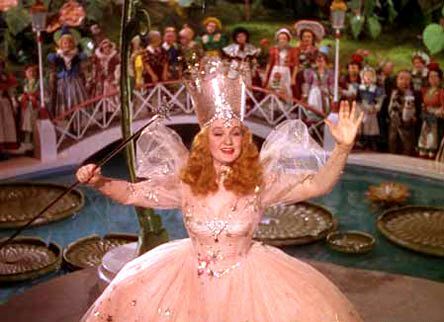 Baum's beloved 1900 novel The Wonderful Wizard of Oz refers to Glinda as the Good Witch of the South. Later books call her a "sorceress" rather than a "witch". Baum's writings make clear that he did not view witches as inherently wicked or in league with the Devil, so this change was probably meant to signal that Glinda was even more powerful than a witch. Another explanation may be that he decided to avoid the negative connotations of "witch"; in Queen Zixi of Ix, he had made Zixi a witch, for which she is shunned by fairies. Again, at the end of The Marvelous Land of Oz, Glinda distinguishes between "respectable sorceresses" who do not perform shape shifting magic because it is not honest, and "unscrupulous witches" such as Mombi who will do it; this is why Mombi, rather than Glinda, turns Tip back into the form of Ozma. Glinda is usually described as the most powerful magician in Oz. In The Patchwork Girl of Oz, neither Ozma nor the Wizard can break a spell, but later it is revealed that Glinda can do so. In the books, Glinda is depicted as a tall young woman with red hair in a clinging white dress. Besides a vast knowledge of magic, Glinda employs various tools, charms, and instruments in her workshop. The Emerald City of Oz reveals that she owns a Great Book of Records that allows her to track everything that goes on in the world from the instant it happens. Starting with The Road to Oz she trains the formerly humbug Wizard in magic; he becomes a formidable practitioner, but acknowledges that she is more powerful yet. Glinda's magic is most apparent in Glinda of Oz, Baum's last book. In that book, she undoes Queen Coo-ee-oh's transformation of Queen Rora of the Flatheads, in contrast to her statement in The Marvelous Land of Oz. Glinda lives in a palace near the southern border of the Quadling Country, it's color is of red descent, attended by one hundred beautiful maidens (twenty-five from each country of Oz). She also employs a large army of female soldiers, with which she placed Ozma on the throne of Oz at the end of The Marvelous Land of Oz. Men are not much in evidence in Glinda's society. As a ruler, Glinda is strongly protective of her subjects. She creates gated communities for the rabbits of Bunnybury and the paper dolls of Miss Cuttenclip, and later in The Emerald City of Oz seals off all of Oz from the Great Outside World for its security. However, unlike Ozma, Glinda is willing to ignore strife and oppression in remote corners of Oz like Jinxland and the Skeezer territory as long as it does not threaten the Emerald City or innocent outsiders. Let The joyous News be spread . . . . . . The Wicked Old Witch At Last Is Dead! "Seen Through Dorothy's Eyes of Innocence."